Raw cacao once the Superstar of the natural health world is now stepping aside for a new kid on the block – Carob. From the same plant family as the pea fruit pods of the carob tree at dark brown and deliciously sweet. 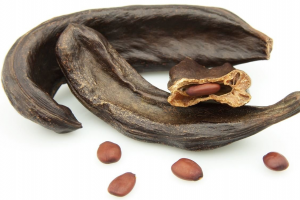 Originally from Greece, carob now grows all over the world and its popularity is growing due to its similarity in taste and texture to chocolate but without the stimulating caffeine and theobromine side effects. For many of us just the thought of chocolate releases the pleasure chemical dopamine in the brain the same part of the brain – the reward centre – that is activated by gambling and cocaine ( doesn’t sound too good does it ) ? Chocolate is often used as a treat to express love , to placate and to pacify children and yet, lesser known to us, chocolate shockingly has more caffeine in it than an espresso. Would you give your child an espresso? Most commercial chocolate bars are chock full of refined sugar too, negatively affecting blood sugar levels, which impacts behaviour and mood. Not only super stimulating, chocolate, even as raw cacao has an energetic quality that is ‘heating’ from a Chinese medicine perspective which can encourage heat in the body leading to imbalances. (heat can be expressed as boils, carbuncles, ulcers diarrhoea etc.). 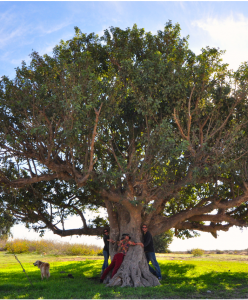 Carob trees grow all over the world from India to Australia. Carob is in contrast, warm, sweet and sour. Warming foods from a TCM perspective, have yang qualities, which are warmness, light, and dryness. Foods in this category are said to enhance blood circulation, dispel the cold, and boost energy of the organs. This is particularly helpful if you suffer from cold symptoms such as cold hands and feet, stomach pain after consuming cold foods or beverages, bloating after eating, sore joints, fluid retention, and edema. Carob has an abundance of good things about it without the downside of stimulating caffeine and theobromine found in all cacao/ cocoa based products. Carob is also an alkaline food that is rich in dietary fibre that is unique to carob. Firstly, Pinitol is a naturally occurring fibre that in research studies has been shown to help keep blood sugar stable. Secondly, the insoluble dietary fibre in carob has been shown to have the same health benefits typical of soluble fibres such as beta-glucan, commonly found in oats. Soluble fibres are widely acknowledged to have cholesterol-lowering qualities. And if you venture to try a SuperTreats bar the added treat is a delicious creamy texture just like a chocolate bar but without refined white cane sugar, playing havoc with your insulin, concentration and moods. The bars taste so delicious that the desire for chocolate quickly dissipates as these Carob treats satisfy in much the same way.